NZUs continue to trade in the range of $2.95–$3.05 per NZU. 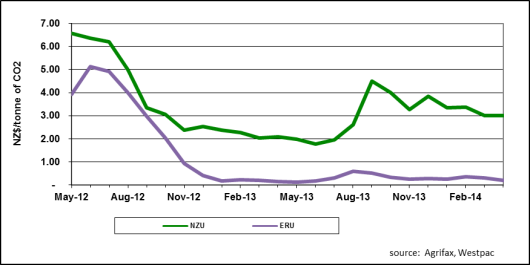 With ERUs valid in the New Zealand ETS until May 2015, there is currently not a lot of demand for NZUs to encourage higher prices. However there are buyers and sellers trading in small volumes. ERUs have come down in price from $0.35 in mid March and are currently trading at around $0.20. ERUs are valid for surrender until the 31 May 2015 and remain the least cost unit for surrender purposes at present. The deadline for deforestation emissions returns for the 2013 year has now passed. However if you know you are deforesting in 2014, you may consider purchasing all or some of the ERUs you require in advance to take advantage of the current relatively low price. It is important to note that deforestation is "a change in land use" OR "not replanting within the four years following harvesting". Harvesting and replanting as part of a regular forest cycle is not deforestation. Also reported last month, post-1989 forest land participants have an option to complete a voluntary emissions returns (VER) annually by the 30th of June and, if completed, participants will receive the New Zealand Units (NZUs) they are entitled to for the carbon stock change for 2013. If a VER is not filed, then the units these participants are entitled to will be received either following the next completed VER or after the mandatory emissions return (MER) in 2018. For any further information on completing a voluntary emissions return for 2013 please contact erin.leahy@pfolsen.com.